Lou Reed’s “Berlin” is one of rock music’s legendary albums – after his successful “Transformer” album former Velvet Underground lead man Lou Reed crafted an ambitious concept album about drug abuse and domestic violence, named "Berlin". The album failed commercially when released in 1973, after which Lou Reed quickly abandoned the material rarely played those songs throughout the rest of his career. The album stayed largely in cult-status circles. 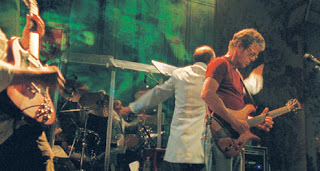 But in 2007 Reed spent five nights in St. Anne’s Warehouse in New York playing the whole album live for the first time. A fellow Warhol-era New York artist and now director, Julian Schnabel ("Before Night Falls", "Basquiat") filmed the concert turning it into a feature concert film. Schnabel is traditional with his treatment of the material. With the help of Michel Gondry's cinematographer Ellen Kuras he shoots the music with the usual language of concert cinema – certainly nothing to challenge, say, “Woodstock” or “Gimme Shelter” or “Stop Making Sense”. Intercut with the band is a smattering of abstract imagery featuring actress Emmanuelle Seigner (last seen in Schnabel’s “The Diving Bell and the Butterfly”). It’s Schnabel material all the way, dreamlike pictures, adding an ethereal texture to the music instead of directly complimenting it. Schnabel’s design of the stage is surprisingly practical and unintrusive. If I didn’t know anything about the film I wouldn’t know that the stage and background imagery were designed by a reknowned artist. Perhaps this is by design so as not to overshadow the music, but Schnabel's presence doesn't add any significant luster or artistic muscle to the film. So the film is all about the music, and unfortunately for Lou Reed fans only. I was unfamiliar with the album and the songs, but it failed to heighten my emotions, straighten the hairs on the back of my neck, or even tap my foot. But personal thoughts on the music are moot because Lou Reed is one of the greats of popular music and the fact this long lost album is being played again is worth the feature film treatment. Enjoy. “Lou Reed Berlin” is available on DVD from Alliance Films in Canada.